APP ISSUES: FYI – The app is shut down for the time being so just go the mobile site on your phones browser, it does exactly the same thing and you can enlarge the live stream with a pinch. The powers that be won’t let me update the APP and re-submit it because they insist it’s too similar to the mobile site…. F’N Apple store messing with me! Sorry for the interruption in service! Tropical Depression Emilia’s strength continues to wane and will likely become post-tropical later today. 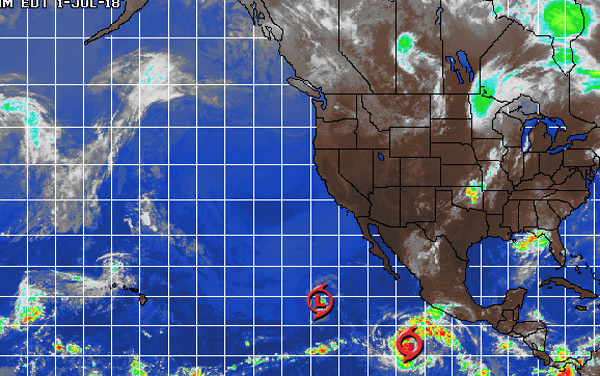 Tropical Storm Fabio has developed and is located about 525 miles south-southwest of Manzanillo, Mexico. Maximum winds are 50 mph. It is moving to the west-northwest at 13 mph and will likely strengthen to a major hurricane in the next few days. Fabio will enter a substantially conducive environment for rapid intensification early next week given lessening mid-upper-level wind shear and very warm water over the region. For Monday morning we’ll continue to see waist high sets for the exposed South facing breaks. This 205-210 degree swell will be strongest in the morning and start a slow, methodical fade throughout the day. The most exposed South facing breaks should also pick up some 10-12 second interval Tropical energy from a sideways 175-180 degree angle. Lastly we’ll have some smallish short interval NW wind swell serving up knee to waist high peaks for the better West facing breaks, (310 degrees with 8-9 second intervals). The conditions look okay with 1-4 MPH breezes out of the S/SW until noon and 7-12 MPH in the afternoon. The air temp gets up to 70 degrees. For Tuesday we’ll be served leftovers in the knee to waist high zone everywhere with a slight pick up in the NW wind swell and inconsistent waist high waves out of the SW. There may be a few straggler sets through the morning but keep your expectations low. The conditions look okay again with 2-5 MPH breezes out of the South until noon and 7-10 MPH out of the South West in the afternoon. The air temp holds at 70 degrees. For Wednesday morning we’ll remain in the knee to waist high zone with the featured player being short interval NW wind swell from a steep 300-310 degree angle. The conditions look okay early with variable winds out of the South in the 1-3 MPH zone until 10AM and 7-10 MPH in the afternoon. The air temp bumps up to 72 degrees. For Thursday morning, based on todays projections, we should see some sizable Hurricane swell moving in throughout the day courtesy of Fabio. While nothing is etched in stone yet the scenario looks promising with Head High to WOH, (Well Overhead), sets possible at the exposed South facing beaches, The angle will swing in from a steep 175 degrees but shift more out of the West throughout the day and into Friday. Stay tuned for details… the Crystal Ball remains a little foggy. Small NW wind swell from 310 degrees and 8-10 second intervals, will remain in the equation. The conditions look fair again with variable, Southerly winds in the 2-4 MPH zone until 10:00AM and 7-9 MPH in the afternoon. The air temp dips a notch to 68 degrees. For Friday morning we’ll see continued Hurricane Fabio swell churn up shoulder to Head High surf with larger OH sets at the top South facing breaks. The intervals should go 14-16 seconds from 180-185+ degree angle. The conditions look fair again with variable 2-5 MPH breezes until noon and 7-14 MPH in the afternoon. The air temp skyrockets to steamy 88 degrees on the sand. Water temps (day of 4CAST update), are as follows: Malibu 65, Santa Monica 70, South Bay 67, Huntington 66, Newport 69.